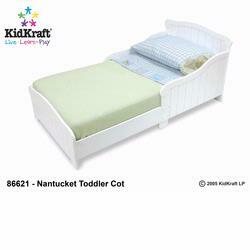 KidKrafts Nantucket Toddler Bed is sized just-right for toddlers. Using the same size mattress as a crib mattress, the transition from crib to bed becomes easier and hassle-free. With wainscoting wooden bedrails to keep kids safe, the KidKraft Nantucket Toddler Bed is finished in white with elegant, smooth lines. Plus, a low-to-the-ground base and mattress offers easy access for toddlers, encouraging independence.